A mound of earth, built for musketry practice to stop rifle fire. Named after the British inventor, Captain William H. Livens of the Royal Engineers, Livens projectors were simple metal tubes - similar to a mortar, used for firing projectiles such as gas bombs or flammable bombs. Used extensively throughout the First World War and in the early part of the Second World War, the need for Livens projectors declined as warfare became highly mobile. Also known as Sulfur Mustard, or Yperite, as it was first used by the German Army at Ypres, Belgium, during the First World War, mustard gas owes its name to its distinctive ‘mustard’ smell and colour. 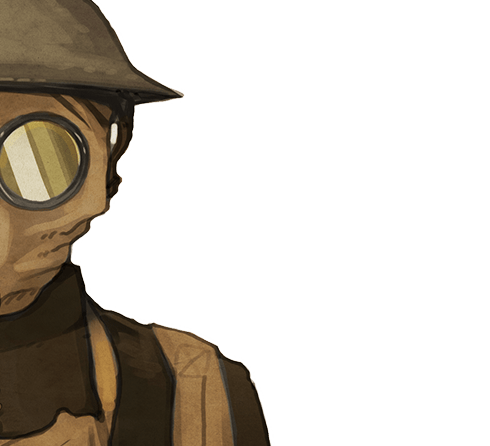 Although not generally lethal, contact with mustard gas can cause anything from severe skin, eye, and nasal irritations, to temporary blindness, diarrhea, fever, and vomiting. Standing-to refers to a soldiers being mustered in a defensive battle formation just before dawn - which was the most likely time for the enemy to attack. ‘Standing-down’ signalled the end of their day or duty for the time being.